Lung cancer is treated in our Thoracic Oncology Program (TOP) within the Upstate Cancer Center. Lung cancer is the leading cause of cancer deaths in the US for both men and women. The physical exam combined with all of your test results, will help to determine the stage of cancer you have. Staging is used to guide your treatment plan. Like other cancers, lung cancer is staged from I-IV. Stage I is a very localized cancer, while stage IV indicates a spread to other parts of the body. The goal of treatment is to eliminate the cancer and/or control the symptoms. Radiation therapy is the use of radiation to kill cancer cells and shrink tumors. This may also be used to relieve symptoms such as shortness of breath. External radiation is usually used to treat lung cancer. With this treatment, radiation is directed at the tumor from a source outside of the body. Cryosurgery—A treatment that freezes and destroys cancer tissue. Do not start smoking. If you smoke, talk to your doctor about how to successfully quit . Try to avoid or limit occupational exposures. The American Lung Association and American Cancer Society both suggest that screening for lung cancer with a low-dose CT scan may be considered if you are a smoker (or former smoker), aged 55-74 years, and have a history of heavy smoking (such as one pack a day for 30 years). Library resources related to lung cancer. This is the most common type of lung cancer. About 85% of lung cancers are non-small cell lung cancers. Squamous cell carcinoma, adenocarcinoma, and large cell carcinoma are all subtypes of non-small cell lung cancer. See the American Cancer Society's Non-Small Cell Lung Cancer Guide for detailed information. Small cell lung cancer is also called oat cell cancer. 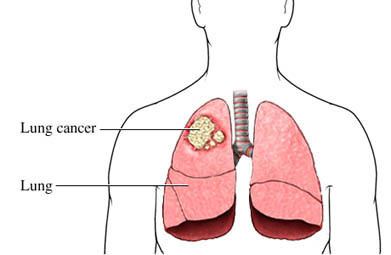 About 10%-15% of lung cancers are small cell lung cancers. This type of lung cancer tends to spread quickly. See the American Cancer Society's Small Cell Lung Cancer Guide for detailed information. Fewer than 5% of lung cancers are lung carcinoid tumors. They are also sometimes called lung neuroendocrine tumors. Most of these tumors grow slowly and rarely spread. See the American Cancer Society's Lung Carcinoid Tumor Guide for detailed information. Lists cancer drugs approved by the Food and Drug Administration (FDA) for lung cancer. Information on Lung Cancer from NIH SeniorHealth a subset of the National Institute of Health website. Information on Lung Cancer from the Mayo Clinic. Online tool to assess risk of lung cancer and learn about ways to lower that risk.